The koala is a small bear-like, tree-dwelling, herbivorous marsupial which averages approximately 9kg's in weight. Its fur is thick and usually ash grey with a tinge of brown in areas. The koala gets its name from an ancient Aboriginal word meaning "no drink" because it receives over 90% of its hydration from the Eucalyptus leaves it eats. The koala only drinks when ill or in times when the eucalyptus leaves don't encompass enough moisture, during droughts etc. The koala is the only mammal, other than the Greater Glider and Ring tail Possum, which can survive eating a diet based upon, eucalyptus leaves. They live in a range of temperate, sub-tropical and tropical forest, woodland and semi-arid communities. 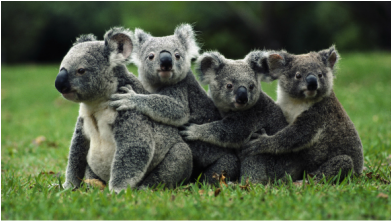 Koalas are found in Australia, in particular areas of Queensland, Victoria, New South Wales, and South Australia. 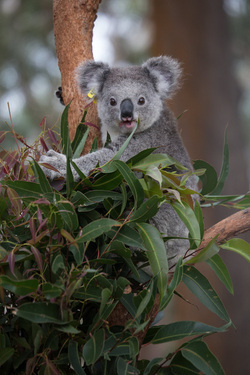 ﻿In some regions koala's face increasing threats from urban expansion, disease, habitat loss, vehicle strike, predation by dogs, and severe susceptibility to drought and climate change. Humans have acted out a great deal to hurt koalas, both directly and indirectly. During the late 1800s, koalas became an export commodity for their fur﻿. ﻿﻿Since European settlement, approximately 80% of Australia's eucalyptus forests have been decimated. Of the remaining 20% next to nothing is protected and most occurs on privately-owned land. Current settlers favor the rich fertile lands along the eastern seaboard, in which they decide to expand their farms and urban developments. Unfortunately, this is where the majority of koalas are already living because typically they too reside in trees which are growing in fertile soils. agriculture, housing, mining, forestry, factories and roads. The koala is currently not an endangered species. Having said that, however, the koala is certainly vulnerable in some parts of Australia. In southeast Queensland, for example, where the population growth has resulted in too many housing developments, the koalas population is expected to be extinct by 2020. Here, various organisations are working to preserve koala habitats and protect them from being destroyed by urbanisation. We can help the koalas from becoming endangered by practicing responsible pet ownership and keeping our dogs locked up at night. In renowned koala areas, drive carefully, as koalas will wander across a street in their home range of eucalyptus trees without regard for oncoming traffic. From 2012 to 2013, the RSPCA admitted 11, 563 injured or displaced wildlife patients to the RSPCA Wildlife Hospital. With the rapid expansion of the human population bringing about land-clearing for urban development, wildlife casualties are expected to continue to rise. The number of koalas brought into care by the RSPCA is very high and emphasizes their vulnerable status and their decreasing numbers. The Government has taken an understandable interest in the status of koalas. The Environment Minister Andrew Powell, has accepted for koala to be downgraded and broadened into a more vulnerable position around Queensland's state. Since 2004, the koala has been threatened and classified as "vulnerable" in the south-east Queensland bio-region, stretching from Gladstone south to the border and west to Toowoomba. In the rest of the state, it is classified as threatened, but of "low concern". The Queensland's Species Technical Committee in charge of the conservation status of fauna and flora in Queensland, has recommended the change. People can take action by reducing the number of negative impacts they have on our native wildlife, such as koalas. This includes being more vigilant when driving in areas known to have high koala populations. They can further help reduce the deaths by locking up their pets at night so that they do not attack wildlife. Furthermore, individuals can indirectly help to support koala populations by donating to organisations and fundraisers that aid in koala protection. Groups are already doing a fantastic job by organizing campaigns to raise money for koalas, which provides them with a better and safer environment to live in. Groups such as the Australian Koala Foundation have their own campaigns, they donate money for koalas, they have a gift shop to purchase any items for fundraisers and they have Koalas that you can adopt and look after. Groups likes these are spread all around the world not just for koalas, but for other endangered animals in a bid to raise awareness to their plight. Examples of the impacts of these groups include highlighting habitats with high populations of koalas that would be endangered by human activity. Thus, they help to erect signs that say "Koala zone, drive safely", to help minimize the amount of koala deaths on our roads. Between July and September, koalas spend more time moving across the road as adult males seek to find mates and disperse themselves into new habitats. Over 300 Koalas die in Southern Queensland each year because of car incidents. The Government has the most important and influential role, possessing the authority to stop infrastructure development such as homes, schools and roads. The Government provides money to organisations to support the animals and provide education so that current and future generations can make educated decisions regarding urbanisation, pollution and deforestation.